The Handbook of Self-Regulation represents state-of-the-art coverage of the latest theory, research, and developments in applications of self-regulation research. 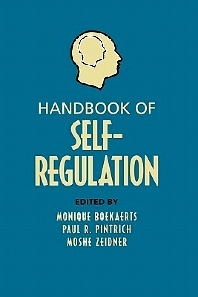 Chapters are of interest to psychologists interested in the development and operation of self-regulation as well as applications to health, organizational, clinical, and educational psychology.This book pulls together theory, research, and applications in the self-regulation domain and provides broad coverage of conceptual, methodological, and treatment issues. In view of the burgeoning interest and massive research on various aspects of self-regulation, the time seems ripe for this Handbook, aimed at reflecting the current state of the field. The goal is to provide researchers, students, and clinicians in the field with substantial state-of-the-art overviews, reviews, and reflections on the conceptual and methodological issues and complexities particular to self-regulation research. II WHAT TURNS A POTENTIAL LEARNING OPPORTUNITY INTO A SITUATION THAT THE STUDENT IDENTIFIES AS SUCH? Monique Boekaerts is Professor of Educational Psychology at Leiden University (The Netherlands) and chairs the Research Committee of the Faculty of Social Sciences. As a principle investigator, she is supervising a national school reform program in vocational schools. Her main field of interest is self-regulated learning with a focus on motivation, volitional control, coping with stress, and soliciting social support. President-elect of the European Association of Learning and Instruction and President of the Educational and Institutional Psychology division of the International Association of Applied Psychology, she has written over 100 scientific articles and book chapters. She serves as associate editor of Learning and Instruction and as reviewer for several international and European journals. Moshe Zeidner is Professor of Educational and Social Psychology at the University of Haifa, Israel. He serves as Director of the Center for the Interdisciplinary Research on Emotions and Scientific Director of the Laboratory for Cross-Cultural Research in Personality and Individual Differences. His main field of interest is personality and individual differences research, with particular concern for anxiety, stress and coping, and the personality-intelligence interface. He is series editor for two series: Human Emotions, and Human Exceptionality. He also serves as Associate Editor of Anxiety, Stress, and Coping: An International Journal and a reviewer for a number of APA journals. He is the author of over 100 scientific papers and chapters and his recent books include: Test Anxiety: The State of the Art, (1998), Handbook of Coping, Stress, Anxiety, and Coping in Academic Settings, and, International Handbook of Personality and Intelligence.